Family Finances: What are Things I Can Do to Save Money? 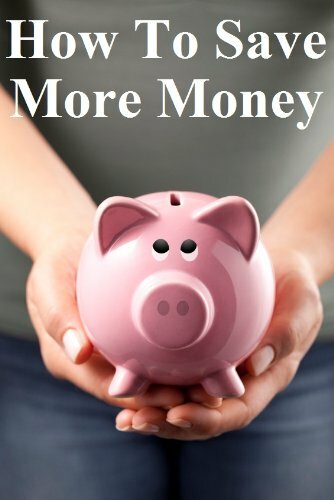 Follow these smart money saving ideas to help you keep more money in your pocket and buy the best self-help money books available. I was always a saver, even as a child. I dutifully put any change I was given or found into a glass jar I hid in my room. Call me weird, but I could entertain myself for hours stacking and counting money, eager to reach the next milestone, $10, $20, et cetera. If I actually had to spend some of my money, I would get sick to my stomach. I'd end up begging my mother to please buy it for me, I didn't want to spend my money. Saving money is so much easier when you don't have to spend it. Now I'm a single mother taking care of an elderly parent. Saving money is a necessity. I've read countless articles and books to help me trim my spending. I would like to share with you some of the best ways I have found to save money and prepare for my financial future. How to Get Emergency Money? You Gotta Save! If you don't already have a savings account, go open one. Now. There will come a time when you'll need extra cash. Something in the household is going to need repairs, or, worst case scenario, you could lose your job. 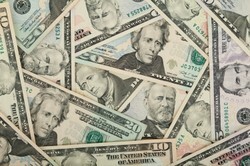 Sometimes it's hard to find the extra money to deposit into a savings account, but it's important to add money monthly. Sure, you can tell yourself that you really need to buy lunch at work this week, or the kids just have to have the hottest, newest item that all their friends have. So how much money should you put in a savings account? As much as your budget will allow. Treat your savings just like any monthly bill. If your budget only allows you to save $25 every paycheck, then faithfully pay that $25 as if it were a bill. Automatically have your bank transfer money from your checking account to a savings account. If your bank does not offer that service, there are great online alternatives. SmartyPig by BBVA Compass Bank lets you set up an online savings account. SmartyPig is fun, interactive, and easy to use. Simply sign up, link your bank account, set a savings goal, and tell SmartyPig how often and how much you want deducted from your checking account. Nearly all of us have too much stuff, especially if you have children. Kids grow out of clothes nearly as fast as you buy it for them. I bet there are toys in great condition in their closet they no longer play with, too. Don't just throw or give it away, sell it and get some cash. Make money selling stuff on Ebay. It's a great place to sell items, especially anything kid related. Ebay regularly offers free listings, which means you don't pay any fees until your items sell. Holding garage and yard sales are an easy way to get rid of things that are cluttering up your house. Even items that you think have no value can sell. The saying really is true, "One man's trash is another man's treasure." I wanted to go on vacation to see family one year, but didn't have enough money for a ticket. I had a yard sale and raised enough money to buy my ticket. Yard sales can be very profitable. If you live in an apartment or yard sales are not permitted in your area, a great alternative to yard sales are flea markets. If you're a busy person who doesn't have time to list and ship items on Ebay or hold a yard sale, consignment shops are for you. Save your newest looking items for consignment shops. Like new or gently worn clothing is what consignment shops are looking for. Making money at consignment stores is easy. These shops sell your items for you and give you a percentage of the sales. I sold a lot of my son's baby clothes and furniture this way. The money can quickly add up if you have good items and the shop is a busy one. Your grocery bill can be one of the hardest to trim down. After all, a person's got to eat, right? It's not impossible, you can save money on your food bill, you just have to get smart about it. Shop weekly sales. If you see something you use often that's on sale, go ahead and buy it, even if you don't need it at that moment. If you wait till you need it, you'll pay full price. Use coupons. When shopping the weekly sales, match what's on sale with what coupons you have. I have gotten many items free this way. Say ranch dressing is on sale buy one get one free, and you have two coupons that are $1 off each. If the dressing is only $1.99, you just got two bottles of dressing for free. Buy store brands. Almost without fail the store brand tastes just as good as the commercial brand but is half the price. Make lunches, snacks, and most meals at home. Buying prepackaged foods or eating out adds up quickly. Instead of buying individual packets of trail mix, make your own. Don't buy Hamburger Helper for a quick dinner, make your own. Free is good, so why would you want to turn down something that doesn't cost a dime? A friend of mine has recently turned me on to a website, Freecycle. There are Freecycle groups all over the world. The way the site works is people list items they don't want for free. You contact them and go pick it up. My friend has gotten swingsets, toys, and clothes for her girls, all without spending a dime. Free entertainment can be found if you know where to look. Contact your local chamber of commerce and ask if there are any free community events. In a town near where I live, they offer free movies in the park on summer nights. Museums and libraries will often host free events for kids, such as holiday parties, egg hunts, et cetera. Credit cards can be useful if used correctly, but more often than not they can really get you into trouble. Credit cards have facilitated the "I want it now" mentality in our society. Our parents were smart. They didn't buy something until they had saved up the cash to buy it. Need a new television or go on a family vacation? Save for it. Allot a monthly amount to save and stick to it. For example, you don't want to be paying for your Disney vacation six months after you've already returned. My son and I went on a two week vacation to Alaska and I paid cash for it. It took me a year to save up enough money for us to go, but it was worth it. Using cash also eliminates interest payments and credit card fees. A $100 lamp can end up costing you $150 if you pay only the minimum balance or pay the bill late. 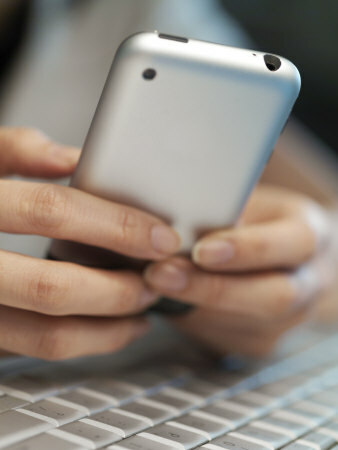 A monthly cell phone bill can really zap your finances. The average cell phone bill has about $20 of local taxes, state taxes, 911 taxes, et cetera. Throw in all the fancy extras and it's easy to be spending more than your plan is worth. I had always been an advocate for a monthly plan. I thought all prepaid phone companies were inferior. Most major carriers have prepaid plans available now. I switched from a monthly plan to a prepaid plan by just calling my cellular company and letting them know what I wanted. Since going prepaid, I save about $60 a month on my cell phone bill. You have to buy your prepaid cell phone outright, but it still is a major savings over a traditional monthly plan. The best investments for a balanced portfolio with a long-term investment strategy is securities: equity, debt, and derivative. Fewer people, for sure. I used to like the store at that time of day, because I could do whatever I needed to get done without being interrupted constantly. I did wonder about our amputee laddie though, whether his early appearance was convenience or whether it was PTSD showing its ugly face and not allowing him to sleep. He never told us what the reason was for his lost limb, but you can imagine that the staff were always wondering. As a former night shift retail worker, we had parents with snoozing children in at 3am this time of year. They said it was the only time they could get the shopping done in peace without their youngster demanding everything that was on the shelf! One of our local regulars was a lad who had lost a leg. He insisted on hopping around with crutches and a trolley (cart) despite our offers of an electric buggy or a staffer to push the trolley for him. He'd be in around 5.30am every Saturday for the week's shopping. You wrote about how I live my life, more or less, Abby. Good to know I'm not alone. Thank you. Apart from the mortgage and monthly bills, my hope is that my husband and I will be debt-free by the end of 2014. Then, if we can't afford it, either I'm going to have to write up a storm to pay for it, or we don't have it. 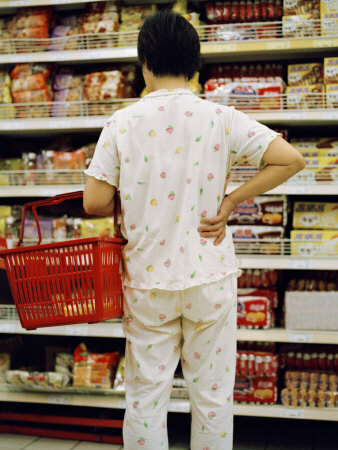 PS: Shopping in your PJs is officially outlawed here in the UK. Dress codes, you see? If you want to shop in your PJs, you should stay at home and shop online seems to be the general idea. It would be worth giving it a try. Thanks for taking the time to read my article! Thank you, Abby, for the article. Freecycle sounds like a great idea. I looked at their Web site and apparently they have 7,020 members in Bucharest. I have some books I don't need anymore. I don't know whether I should try our version of ebay or give them away for free. There's no online service for used books over here and the used books stores in town give you dimes for the chick lit books I want to sell. Thank you very much for taking the time to read my article. My friend has gotten unbelievable things off of Freecycle. It's amazing and well worth looking in to. P.S. I stopped and thought about shopping in my P.J's there are so many times I think about running to the store with my hair a mess and in my pajamas but my girls always say, "Mom your not going out like that"
Looking to buy or sell gift cards? Don't do anything until you read this article. I'll answer your questions about used gift cards and give you a list of trustworthy websites. Pack shopping, allotments, whole posses cutting out coupons. Discover ways in which communities can act together to increase the household budget of all.